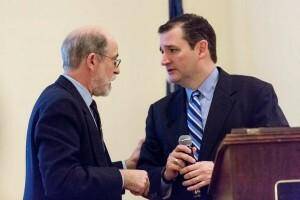 On Thursday, Cruz revealed his national-security advisory team. The first name on the list? Frank “Obama is a Muslim” Gaffney, Bloomberg reports. Gaffney is the Joe McCarthy of Islamophobia. His think tank, the Center for Security Policy, is dedicated to raising awareness about the jihadist infiltration of the American government. For Gaffney, Barack Hussein Obama is but the tip of the iceberg — in truth, the Muslim Brotherhood has placed operatives throughout the federal government.